The Technology Services Multi-Tenant Munki (MTM) system has a web application that allows IT Pros to manage their computers, user groups and repositories. The Multi-Tenant Munki (MTM) portal may be accessed via the address https://munki.eps.uillinois.edu. 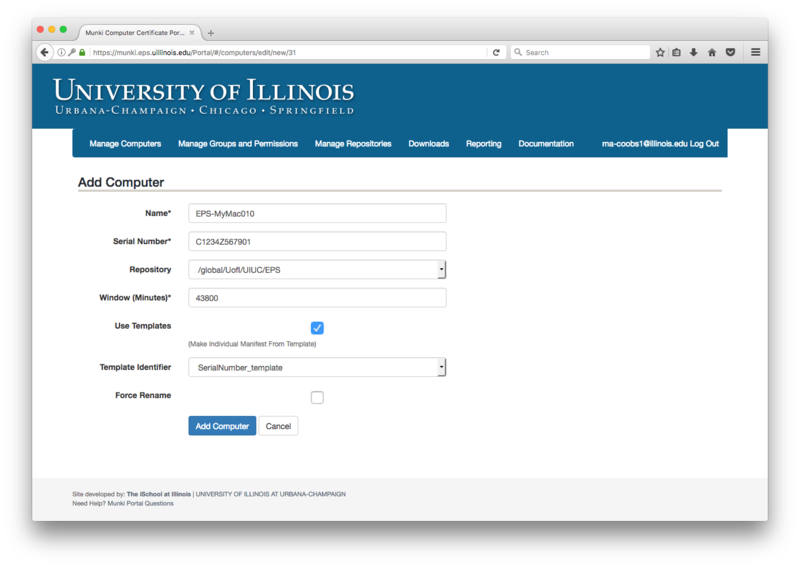 In order to login, your unit must already be provisioned and have a repository created. In addition, your username must be a member of your repository's Active Directory group. If your unit has not yet been provisioned, please contact the Endpoint Services (EPS) team to get started. The MTM system generates per-machine certificates that allow a computer to access its assigned MTM repositories. These certificates are generated and assigned to both a repository and computer when a computer is imported into the MTM database. Computers must always be imported before running the MTM Onboarding package. When importing a computer, IT Pros can either import a single computer or do a bulk import using a CSV file. 2. Click the Manage Your Computers link. 5. Enter the computer's information into the fields. Name A unique name for the computer. The computer’s serial number. Almost always capitalized. Repository Typically your unit’s main repository unless you have multiple repositories. Number of minutes that the time window will last, during which the computer can be onboarded and receive its per-machine certificate. Specify whether you wish to use a template to generate the computer's manifest. Typically, you will check the Use Template checkbox. Review the Using Manifest Templates section below for additional information. Will rename the computer to match the Name field. 6. Click the Add Computer button when finished to import the computer into MTM. Be sure to check that no errors occurred during the import. The MTM portal also allows for IT Pros to bulk import one or many computers using a CSV file to populate the data. The CSV Upload function can also be used to update existing computers that have already been imported into the MTM portal. 4. Download the CSV template file or use the Export as CSV button to get a CSV template. A unique name for the computer. If 'Use Template' is set to 0, this will set the 'client_identifier' preference key for Munki. If 'Use Template' is set to 1, this is the name of the template file used to generate the computer manifest (case sensitive). If set to 0, MTM will not use a template file to generate computer manifests. If set to 1, MTM will use the name of template file that is set in the 'Client Identifier' column to generate computer manifests. Specifies whether you wish to use a template to generate the computer's manifest. If set to 0, MTM will not overwrite any computer manifest files if they already exist. If set to 1, MTM will overwrite existing computer manifest files with a new copy using a template as the base. If set to 0, MTM will not change the computer's name. If set to 1, MTM will change the name on the computer to match the Name field. Default is 0. If set to 1, MTM will delete the computer and certificate. Be careful as this is irrevocable. 8. Check the box(es) for any columns you want the MTM portal to process in your CSV file. The MTM portal will ignore any columns in the CSV file that are unchecked while uploading the CSV file. The MTM portal will also ignore extraneous columns that don't correspond to any of the checkboxes. 9. Click the Upload button to finish importing your computers into MTM. Be sure to check that no errors occurred during the upload. The EPS team recommends the creation of a single manifest for each computer and naming the manifest file to match the computer's serial number. To make this easier, the MTM portal allows for the creation of computer manifests using templates. To use manifest templates, place template manifest files inside the 'templates' subdirectory within the 'manifests' directory of your Munki repository. Any manifest files found within this 'templates' directory can be used as a template for creating manifests using either of the import methods above.